Physical Therapy continuing education is required by nearly every state for licensure renewal. As you may know, Physical Therapists are licensed on a state by state level, not through a central organization like the APTA (American Physical Therapy Association). So the requirements for Physical Therapy continuing education can vary from state to state. Below you can find the CEU requirements for PTs by state and a link to each state’s practice act page further explaining the requirements in exact detail. As you’ll see, each state can specify the kind of course that is accepted for CEUs as well as alternative ways to earn CEUs besides attending a course. Here are some of the most uniqarue ways to satisfy the continuing education requirements for Physical Therapy license renewal. While most PTs think of in person CEU courses and even online CEUs for PTs, there are many other ways to earn CEUs if your state allows. For example, in Michigan you can earn CEUs through 19 different ways, including many of the opportunities listed below. Your state may offer similar opportunities to earn a CEU, so read your state’s requirement page and find inspiration in this list below. Write a book chapter or submit a paper. Take a post graduate college course. Nearly every state will accept online CEUs for Physical Therapy license renewal. I personally use the online CEU provider MedBridge to satisfy over half of my education requirements for my PT license. While there are many different online CEU providers, the quality in course presentation can vary significantly. Here are some of the key considerations when selecting an online CEU provider. State Approval: Many states will accept CEUs that have been approved in other states, however, you need to verify that a course meets the standards for your state’s practice act. A quality CEU provider will be able to quickly tell you if the course if accepted in your state. Affordability and Convenience: While most online CEUs may boast convenience, they’re not all created equal. Ideally you would have access to multiple courses for one price so that you can take as many courses as you want, lowering the average cost of your CEUs dramatically. Professional and High Quality: We’ve all been in a classroom where the instructor was boring, unorganized, or simply read slides to you. An online CEU course should have clear objectives, be well organized, and provide you with resources (powerpoint or handouts) that are relevant. There’s a good chance that you’ll receive dozens of postcards each year advertising live CEU courses for Physical Therapists. If your state requires a certain number of in-person CEUs, you might be tempted to sign up for a cheap CEU course. Be careful in signing up for the first course you see! Do a search on your state’s PT association website to view local courses as you might overlook an excellent course that didn’t advertise with a postcard. A quick note… “Odd years” simply mean years ending in an odd number…1,3,5,7,9 “Even years” mean years ending in an even number…2,4,6,8,0. I know you didn’t need this explanation, but someone might be confused by my short hand to simplify the requirements. Also, some states don’t technically describe education units as a CEU. Some label it as “PDR” or professional development requirement or Continuing Education Credit. Some states describe one continuing education credit to equal 10 hours of a learning experience, so a requirement of “2 CEU credits” really mean 20 hours of continuing education. I’ve simplified the requirements of each state and have included the actual text from the state’s practice act in the section below the immediate list. Alabama – 10 CEU hours every year by September 30th. Alaska – 24 CEU hours every 2 years by June 30th of even years. Arizona – 20 CEU hours every 2 years by August 31 of even years. Arkansas – 20 CEU hours (PT), 10 CEU hours (PTA), every 2 years by December 31 even years. California – 30 CEU hours every 2 years by last day of license holder’s birth month. Colorado – 30 CEU hours every 2 years by October 31 of even years. Connecticut – 20 CEU hours every year by last day of license holder’s birth month. Delaware – 30 PT CEU hours every 2 years by January 31 of odd years. Florida – 24 PT CEU hours every 2 years by Nov 30 of odd years. Georgia – 30 PT CEU hours every 2 years by December 31 in odd years. Hawaii – 30 PT CEU hours every 2 years by December 31 in even years. Idaho – 16 PT CEU hours every year by last day of PT’s birth month. Illinois – 40 PT CEU hours every 2 years by September 30 in even years. Indiana – 22 PT CEU hours every 2 years by June 30 in even years. Iowa – 40 PT CEU hours every 2 years by 15th day of PT’s birth month. Kansas – 40 PT CEU hours every 2 years by December 31 in even years. Kentucky – 30 PT CEU hours every 2 years by March 31 in odd years. Louisiana – 30 PT CEU hours every 2 years by March 31 in odd and even years based on PT’s birth year. Maine – No CEU requirements. License renews in March 31 of even years. Maryland – 30 PT CEUs every 2 years by March 31. Massachusetts 0 No CEU requirements. License renews on PT’s birthday. Michigan – 24 CEU (credits) every 2 years by July 31. Mississippi – 30 PT CEU hours every 2 years by June 30th of odd years (last name A-L) and even years (last name M-Z). Missouri – 30 PT CEU hours every 2 years by December 31 in odd years. Montana – 30 PT CEU hours every 2 years by April 1 of odd years. Nebraska – 20 PT CEU hours every 2 years by November 1 of odd years. Nevada – 15 PT CEU hours every year by July 31. New Hampshire – 24 PT CEU hours every 2 years by December 31 in even years. New Jersey – 30 PT CEU hours every 2 years by January 31 of even years. New Mexico – 30 PT CEU hours every 2 years by January 31. (odd/even years vary. License ending in odd number: renew in even year. Odd years for for even license number. New York – 36 PT CEU hours every 3 years by last month of PT’s birth month. North Carolina – 30 PT CEU hours every 2 years. North Dakota – 25 PT CEU hours every 2 years by January 31. Ohio – 24 PT CEU hours every 2 years by January 31. Oklahoma – 40 PT CEU hours every 2 years by December 31 of odd years. Oregon – 24 PT CEU hours every 2 years by March 31 of even years. Pennsylvania – 30 PT CEU hours every 2 years by December 31. Rhode Island – 24 PT CEU hours every 2 years by March 31 in even years. South Carolina – 30 PT CEU hours every 2 years by December 31 in even years. South Dakota – No CEU requirements. License renews January 1 every year. Tennessee – 30 PT CEU hours every 2 years due on last day of month prior to birthday. Texas – 30 PT CEU hours every 2 years by last day of PT’s birth month. Utah – 40 PT CEU hours every 2 years by May 31 in odd years. Vermont – 24 PT CEU hours every 2 years by September 30 in even years. Virginia – 30 PT CEU hours every 2 years by December 31 in even years. Washington – 40 PT CEU hours every 2 years by PT’s birthdate. West Virginia – 24 PT CEU hours every 2 years by December 31. Wisconsin – 30 PT CEU hours every 2 years by February 28 on odd years. Wyoming – 30 PT CEU hours every 2 years by October 1. Each license expires on October 1 of the year following its issuance. Annual renewal period is July 1 through September 30. 10 hours of continuing education required at renewal. License by Endorsement must complete a 2 hour Alabama Jurisprudence continuing education course before first renewal. All licensees must have 2 hours of Alabama Jurisprudence continuing education every 5 years (2020, 2025, 2030, etc.). The rules that describe continuing competence activities (Article 4 in the board’s administrative rules, A.A.C. R4-24-401–R4-24-303) establish 3 categories of activities that can fulfill the requirement for license renewal, which is 20 hours during each 2 year compliance period. A compliance period begins on September 1st of even-numbered years and ends on August 31st of the following even-numbered year. At least 10 contact hours must be from Category A, up to the entire 20 contact hour requirement. No more than 10 hours may be utilized from a combination of Category B and/or Category C activities. Because of the variety of conversions used to determine CEU’s by different organizations, the rules require “contact hours” rather than “CEUs” as the measurement of continuing competence activities. CEU = continuing education unit. One unit is defined as 10 contact hours of an accredited course or program. A contact hour is equal to actual time in a seminar or workshop. CEUs should be acquired between January 1, 2017 and December 31, 2018 to be credited for 2019 renewal. Individuals licensed as new graduates or by endorsement in 2017 and 2018 are not required to complete CEUs for 2019 renewal and begin accumulating in 2019 for 2021 renewal. Individuals who were previously inactive and reinstate their license in 2017 and 2018 are required to complete continuing education between January 1, 2017 and December 31, 2018 for 2019 renewal. Continuing education used to reinstate a license cannot be used for 2017 renewal. Continuing competency hours must be earned during the renewal period. Your renewal period begins the day after your license expires or issue date and ends on your expiration date. For example, if your license expires on September 30, 2011, your continuing competency hours must be completed during the period October 1, 2009 – September 30, 2011. New Licensees If you are in your first 13-24 months of licensure in California and renewing your license for the first time, use this chart to help you determine the number of continuing competency hours required (if you are not a new licensee use the chart below under NOT a New Licensee). NOT a New Licensees If you are a Licensee that has renewed your license one (1) or more times, use this chart to help you determine the number of continuing competency hours required. The Continuing Professional Development (CPD) program entails the following: The licensee shall complete the Reflective Self-Assessment Tool (RSAT) once per 2- year renewal period. A licensee shall use the Board approved form. The execution of a Learning Plan once per 2-year renewal period that is based upon the licensee’s Reflective Self-Assessment Tool (RSAT) or Assessment of Knowledge and Skills (AKS). A licensee shall use the Board approved form. ii. Accrual of 30 points of Professional Development Activities (PDA) per 2-year renewal period. Professional Development Activities (PDA) Professional Development Activities must be relevant to the licensee’s practice as a physical therapist and pertinent to his/her Learning Plan. The Board will not pre- 19 approve specific courses or providers. The licensee shall determine which activities and topics will meet his/her Learning Plan, and select an appropriate provider. Professional Development Activities are separated into Category I, Category II, and Category III activities and each category has a corresponding point value. Points are used in lieu of continuing education units (CEU) or contact hours to allow credit for non-continuing education type activities. c. Points will be accepted if the activity is included in the Board’s Professional Development Activities List. The Board may accept or reject activities submitted for consideration that are not identified on its list. d. A minimum of 15 of the required 30 points must be Category I activities. e. Professional Development Activities will only apply for one 2-year renewal period. “Each licensee applying for license renewal shall complete a minimum of 20 hours during the one year period for which the license is being renewed. 13.1 Three CEU’s are required for every biennial license renewal for Physical Therapists, Physical Therapist Assistants, and Athletic Trainers. The required CEU’s shall be completed no later than January 31 of every odd-numbered year and every 2 years after such date. The required hours shall include 0.2 units of Ethics and proof of current CPR certification by the American Red Cross, American Heart Association, National Safety Council or other agency approved by the Board and posted on the Division of Professional Regulation’s website. Proof of current CPR certification will count for 0.1 CEU. 13.1.1 One CEU will be given for every 10 hours of an approved continuing education course. (1 contact hour = .1 CEU). Continuing Education Requirement: Physical Therapists must complete forty (40) contact hours of continuing education (only 20 can be only can be online/home study). Continuing Education Requirement is NOT required for 1st-time renewal applicants. Submission of CE hours is not required for first (1st) time renewal applicants. DO NOT send documentation verifying your compliance with CE requirement unless asked to do so by the Board. The Board will perform a CE audit following the 2015 renewal period. Documentation mailed to the Board will not be returned. Twenty-four (24) contact hours of continuing education (CE/CEU*) must be completed within the current biennium for which the license is being renewed. (Bienniums run from 12/1/odd year-11/30/next odd year. For example, 12/1/2013 – 11/30/2015 is a licensure biennium). Continuing Education Unit (CEU): One continuing educational unit shall be considered equivalent to 10 contact hours. You must complete 24 contact hours of approval continuing education per biennium. No more than 12 hours may come from home study/online courses. All licensees must complete 2 hours on the Prevention of Medical Errors for each licensure renewal cycle. This is to inform you that beginning with the December 31, 2016 renewal, each physical therapist with an active Hawaii license is required to obtain at least thirty (30) units of approved continuing competence units (“CCU”) in each two-year license renewal period, where one continuing competence unit is equivalent to at least fifty (50) minutes of classroom or hands on instruction. See, Hawaii Revised Statutes (“HRS”) section 461J10.1. “Beginning with the September 30, 2004 renewal and every renewal thereafter, every physical therapist shall complete 40 hours of continuing education (CE) relevant to the practice of physical therapy during each prerenewal period as a condition of renewal. Effective February 27, 2013 all PT and PTA licensees will be required to obtain continuing education competency in order to renew their license. The Committee will require all licensees to have completed twenty-two (22) hours of continuing competency activities for the biennial renewal period, of which two (2) hours must be in an ethics and Indiana jurisprudence course as it relates to the practice of physical therapy. These hours must be obtained within the renewal period and cannot be carried over from one renewal period to another. 645—203.2(148A) Continuing education requirements. 203.2(1) The biennial continuing education compliance period shall extend for a two-year period that begins on the sixteenth day of the birth month and ends two years later on the fifteenth day of the birth month. Requirements for physical therapist licensees. Each biennium, each person who is licensed to practice as a physical therapist in this state shall be required to complete a minimum of 40 hours of continuing education approved by the board; a minimum of 30 hours shall be directly and primarily related to the clinical application of physical therapy. As a condition of renewal for each odd‐numbered year, each licensed physical therapist or certified physical therapist assistant shall submit, in addition to the annual application for renewal of licensure or certification, evidence of satisfactory completion within the preceding two‐year period of at least 40 contact hours of continuing education for a licensed physical therapist and at least 20 contact hours of continuing education for a certified physical therapist assistant. (B) Evidence of satisfactory completion of a program of continuing education shall not be required to be submitted with the application for renewal of licensure or certification in even‐numbered years. (2) A contact hour shall consist of 60 minutes of activity pertaining to the practice of physical therapy. (3) Meals and breaks shall not be included in the contact hour calculation. According to 201 KAR 22:045, physical therapists must complete 30 hours of continued competency activities (20 hours for physical therapist assistants) prior to renewing their credential. Many of those activities, particularly continuing education courses, require application for review and approval by the Kentucky Physical Therapy Association’s Professional Continued Competency Committee. The review process typically takes 4 – 6 weeks to complete. A. Unless exempted under ý198, licensees shall successfully complete, document and report to the board at least 30 hours of boardýapproved continuing education courses or activities in the biennial renewal period. No carryover of continuing education hours from one renewal period to another shall be allowed. Continuing education will be granted in the reporting period in which the academic coursework, clinical instruction, tool, residency, or fellowship is completed. 4. administrative―a maximum of eight contact hours may be applied during each renewal period. Additional clinical/preventive hours may be substituted for administrative. C. No more than 15 hours of continuing education submitted to the board shall be home study, internet or online courses or by other distance learning methods. This excludes the jurisprudence requirement, if taken online. Licenses are renewed biennially on an odd-even basis via on-line system. License numbers ending with an odd-number renew in odd-numbered years. License numbers ending with an even number renew in even-numbered years. Renewals begin on March 12 for the 2018 renewal. Letters with instructions are sent out the 1st week in March. The instructions will also be available here when the link is up. The Board must receive your online renewal by May 21st to ensure that your license is mailed back to you before May 31st. Failure to renew your license prior to its expiration date will result in loss of licensure and the right to practice physical therapy/limited physical therapy in Maryland. Licensees are not required to take courses that are only on the “Approved” list. Please review the regulations. Licensees must have earned the 3.0 CEUs for a PT, or 2.0 CEUs for a PTA. MA does not currently have a requirement for CE as a condition of license renewal. It is recommended that all licensees engage in continuing competence. PT and PTA licensees will need to accumulate 24 PDR credits within 2 years immediately proceeding renewal. (Example: Those renewing in July 2020 must accumulate 24 PDR’s between August 1, 2018 and July 31, 2020. • PDRs are required for licensure renewal; not for the initial PT/PTA license. Regulations set the requirement of 30 continuing competence units (CCU) to be accrued during each 2 year licensing period (July 1- June 30). No carryover of continuing competence units from one licensure period to another shall be allowed. At least 25 percent (7.5 CCU) of the required continuing competence units earned during each licensure period must be directly related to the clinical practice of physical therapy. Continuing Competence (CC) activities claimed as clinical are subject to review if considered questionable. All licensees must take three (3) hours of study in ethics, professionalism, or jurisprudence per licensing period as part of their total CC requirements. At least 15 of the 30 required continuing competence units must be from Certified Activities (outlined in Rule 5.4). All licensed physical therapists and physical therapist assistants are required to biennially complete thirty hours (30) hours of acceptable continuing education. Hours must be reported to the Advisory Commission each even-numbered year at the time of renewal. The Federation of State Board of Physical Therapy (FSBPT) offers a free continuing competence resource called aPTitude. This service includes a free tracking tool to assist physical therapist and physical therapy assistant’s track completed continuing competency/continuing education (CC/CE) activities. During the audit of CC/CE, licensees may submit the aPTitude report in lieu of each CC/CE certification of completion. PTs and PTAs all need to have 30 hour/credits of qualified CE in each 24 month period prior to the renewal date on odd years. The next reporting period to obtain 30 hours/credits of qualified CE will be April 1, 2017 through March 31, 2019. Physical Therapists must have completed at least twenty (20) hours of acceptable continuing education AND have passed the Nebraska Law Tutorial with a score of 100% or have met conditions of a waiver between 11/02/2017 through 11/01/2019. Physical Therapist Assistants must have completed at least ten (10) hours of acceptable continuing education AND have passed the Nebraska Law Tutorial with a score of 100% or have met conditions of a waiver between 11/02/2017 through 11/01/2019. 1. Except as otherwise provided in subsections 3, 4 and 5, every physical therapist or physical therapist’s assistant must complete 1.5 units of an approved course within the year immediately preceding his or her application for the renewal of his or her license, of which not more than 0.8 units may be completed in nonclinical courses. 2. The Board will not approve as training for continuing education experience acquired in fields that it determines are unrelated to the practice of physical therapy. 3. A person who is initially licensed as a physical therapist or physical therapist’s assistant between February 1 and July 31 is not required to complete the requirements for continuing education for the period of licensing which ends on July 31 of that year. A licensed physical therapist and a physical therapist assistant shall apply for license renewal and pay the renewal fee as set forth in 16.20.5 NMAC, Schedule of Fees. On July 7, 2008, Chapter 207 of the Laws of 2008, requiring physical therapists and physical therapist assistants to complete thirty-six hours of continuing education during each three-year registration renewal period, was signed into law. Only licensees registering after January 1, 2010, will have to verify that the required number of course hours has been achieved. This site offers information for licensees and entities seeking to be designated as an approved provider of continuing education course work for physical therapists and physical therapist assistants. Changes “clinically related” to “certified activities” The total number of continuing competence units remains the same at 25 units per renewal cycle (i.e. every 2 years). The minimum number of “certified” units which may be applied for the two year recording period will equal 15 units. 1 contact hour is one clock hour spent in a continuing education activity. Physical therapists are required to complete a minimum of 24 contact hours per renewal cycle. Remember that all continuing education activities require valid Ohio Approval Numbers issued by the OPTA (www.ohiopt.org). If you are a Physical Therapist you must obtain forty (40) hours of approved continuing education every two (2) years (i.e. – from January 1, 2014 to December 31, 2015, etc.). If you are a Physical Therapist Assistant you must obtain thirty (30) hours of approved continuing education every two (2) years (i.e. – from January 1, 2014 to December 31, 2015, etc.). The current Certification Period is April 1, 2018 – March 31, 2020. 24 hours, if your license was obtained prior to April 1, 2019. 12 hours, if your license is obtained between April 1, 2019 and December 31, 2019. 0 hours, if your license in obtained between Jan 1, 2020 and March 31, 2020. Continuing Education.–For each license renewal, a licensee shall complete within the immediately preceding two-year period at least 30 hours of continuing physical therapy education as approved by the board. The licensee shall provide the board with evidence of the completion of the continuing education. A – 7 – physical therapist who has met the continuing education requirements for a certificate of authorization set forth in section 9(c)(1) shall be deemed to have met the continuing education requirement for license renewal. No credit shall be given for any course in office management. The certificate of every person licensed under the provisions of this chapter shall expire on the first day of May of the next even year following the date of original licensure. On or before the first day of March of each year, the department shall mail an application for renewal of license to every person to whom a license has been issued or renewed during the current licensure period. Every licensed person who desires to renew his or her license shall provide satisfactory evidence to the department that in the preceding two (2) years the practitioner has completed the twenty-four (24) required continuing education hours as established by the department through rules and regulations and shall file with department a renewal application executed together with a renewal fee as set forth in § 23-1-54 on or before the thirty-first day of March of each even year. The department may extend for only one six (6) month period these educational requirements if the department is satisfied that the applicant has suffered hardship, which prevented meeting the educational requirement. 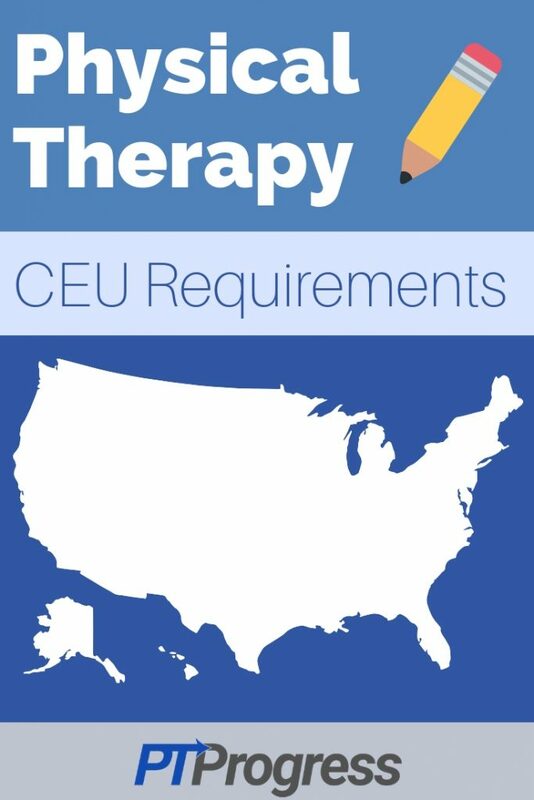 Every licensed physical therapist and physical therapist assistant shall earn 3.0 CEUs or thirty (30) hours of acceptable continuing education credit per biennium year. All licensed physical therapist assistants are now required to obtain 30 hours of credits for the 24 months that precede their licensure renewal month. At least twenty of those hours must be Category 1 activities and no more than 10 hours may be acquired online. Up to ten of the thirty hours may be from Category 2 activities. For both physical therapists and physical therapist assistants, four (4) of the required hours must consist of ethics and jurisprudence courses which are a minimum of two (2) hours each in duration and must be Category 1 continuing competence. Proof of completion of courses in ethics and jurisprudence is required every license renewal cycle. A license may be renewed at any time in the three months prior to its expiration date, with no change in expiration date. Beginning June 1, 2017, individuals renewing their license will be required to take the PT Board’s new Texas Jurisprudence Assessment Module (TX JAM). The TX JAM will replace both the current Jurisprudence (JP) Exam and the ethics/professional responsibility renewal requirement. For more information, click here. A. In order to renew an active license biennially, a physical therapist or a physical therapist assistant shall complete at least 30 contact hours of continuing learning activities within the two years immediately preceding renewal. In choosing continuing learning activities or courses, the licensee shall consider the following: (i) the need to promote ethical practice, (ii) an appropriate standard of care, (iii) patient safety, (iv) application of new medical technology, (v) appropriate communication with patients, and (vi) knowledge of the changing health care system. Physical therapists must renew their license every year on or before their birthday. Physical therapists must complete 32 hours of continuing education and 200 hours of employment every two years. All licensees desiring to remain active and in good standing must complete 24 hours of WV board approved continuing education within the 2-year licensing period. It is each licensee’s responsibility to read and adhere to the Physical Therapy Law for the State of WV. This board’s continuing education requirements are listed in Legislative Rule §16-1-10 found on our website within the PT/PTA tab. Within the CE Info tab, approved courses for the current year are found on the 2018 Approved Courses page, and previously approved courses may be searched on the CE Archive page. Be sure your courses are approved for the exact year each was taken, as approval numbers do NOT carry over. Unless granted a postponement or waiver under sub. (8), every physical therapist shall complete at least 30 hours of board− approved continuing education in each biennial registration period, as specified in s. 448.55 (3), Stats. Four of the required 30 hours shall be in the area of ethics, jurisprudence, or both. (2) Unless granted a postponement or waiver under sub. (8), every physical therapist assistant shall complete at least 20 hours of board−approved continuing education in each biennial registration period, as specified in s. 448.55 (3), Stats. Four of the required 20 hours shall be in the area of ethics, jurisprudence, or both. New continuing competence requirements went into effect January 25, 2016, requiring all license and certificate holders to complete thirty (30) continuing competence units (CCUs) every two years. The Wyoming Board of Physical Therapy (Board) must provide two full years for license and certificate holders to meet this requirement, therefore, anyone due to provide evidence of completion of continuing education with their 2016 renewal shall fall under the old rule of twenty (20) contact hours of continuing education. They will then be placed on the thirty (30) CCUs every two years with that requirement first needing to be met with the 2018 renewal.